Acute pancreatitis is the most common complication of endoscopic retrograde cholangiopancreatography (ERCP) and, in high-risk patients, it presents with a high degree of severity in 20 % of occurrences. Prophylactic treatment with pancreatic stents is becoming an increasingly widespread practice (Figure ), in contrast to pharmacological prevention (e. g., somatostatin, gabexate), which is regarded as being costly, impractical, or (in the case of gabexate) is not available in the USA. Figure 1 Prophylactic pancreatic stent placement after resection of an ampullary adenoma with high-grade dysplasia. a An ampullary tumor is seen obstructing half of the duodenal lumen. b A 5-Fr plastic pancreatic stent has been placed (without proximal flaps, to facilitate spontaneous stent dislodgment). Note the persistent mucosal elevation after submucosal injection of hyaluronic acid, which it was thought might possibly favor post-resection pancreatitis. The meta-analysis by Singh et al. of controlled trials of prophylaxis against post-ERCP pancreatitis with pancreatic stents has overcome the lack of statistical power in previous individual trials. For this meta-analysis, the authors selected five trials which firstly compared the risk of post-ERCP pancreatitis in patients with pancreatic stent placement vs. no stent placement; and secondly, included patients who were at high risk of developing this complication. Among the 481 patients included, post-ERCP pancreatitis was reported three times more frequently in the group without pancreatic stents in comparison with the group with stents (15.5 vs. 5.8 %; odds ratio 3.2; 95 % CI, 1.6 - 6.4). The number needed to treat to prevent one episode of pancreatitis was 10 (95 % CI, 6.3 - 17.9). The main inclusion criteria in these five trials were: firstly, attempted sphincter of Oddi manometry (n = 215, 45 %); secondly, biliary sphincter dilation using a balloon with a diameter of 8 mm (n = 130, 27 %); and thirdly, needle-knife sphincterotomy (n = 104, 22 %); as well as others (n = 32, 6 %). The meta-analysis attempted to resolve some of the issues raised by the individual trials, such as the lack of intention-to-treat analyses and randomization. The five trials selected had reported a per-protocol analysis - i. e., after exclusion of patients in whom attempts at pancreatic stent insertion failed. This was a concern, since such patients are at very high risk of post-ERCP pancreatitis. Singh et al. repeated the meta-analysis with the assumption that, in the absence of information, all patients with failed pancreatic stent insertion had developed post-ERCP pancreatitis. The advantage for prophylactic pancreatic stenting remained statistically significant. However, a true intention-to-treat analysis was not carried out, since pancreatitis complicating stent removal was not included in the meta-analysis (sufficient information was not available in most trials). The authors also found that the advantage in favor of prophylactic pancreatic stenting remained statistically significant after the exclusion of nonrandomized studies. However, they did not identify as such a trial that included three groups, among which the two groups selected for the meta-analysis were not randomized. Other concerns are not resolved by this meta-analysis, including: firstly, a potentially increased risk of pancreatitis in controls related to the study protocol itself (e. g., randomization carried out after cannulation of the pancreatic duct); and secondly, the absence of blinding in all of the trials. The assessment of the primary outcome of these trials by a person who is not blinded to the patients’ allocation group is surprising (and contrasts with practices for drug trials in this indication). This is important because, depending on the definitions used, a case of mild pancreatitis may be difficult to distinguish from post-ERCP abdominal discomfort, and a statistically significant advantage for prophylactic pancreatic stenting has been found for mild/moderate pancreatitis only, not for the less subjectively assessed severe form of pancreatitis. Rashdan et al. compared various pancreatic stents for prophylaxis against post-ERCP pancreatitis (Figure ). They found a lower rate of post-ERCP pancreatitis with 3-Fr stents than with 4 - 6-Fr stents (7.5 % vs. 10.7 %; P = 0.047). (The authors acknowledged that improved endoscopic skills also contributed to these results; 3-Fr stents were used more recently than larger models.) More importantly, almost 90 % of the long unflanged 3-Fr stents spontaneously dislodged within 2 weeks. This avoided the inconvenience, costs, and potential complications (e. g., pancreatitis) of repeating endoscopy for stent removal (stent elimination can be checked by the referring physician using a plain abdominal film). Stent-induced ductal and parenchymal changes in the pancreas have long been a concern, since they develop in about half of patients who receive traditional stents. With 3-Fr models, this was much less frequent; new ductal changes were found in 10 % of the subgroup of patients who had a repeat ERCP for persistent and/or recurrent symptoms long after stent removal (about 15 % of the whole population who had received 3-Fr pancreatic stents). Moderate/severe ductal changes were exceptional (< 1 % of patients, compared to 25 % reported previously with larger stents by the same authors). Although no clinical consequences of such radiographic changes have been demonstrated, less harmful stents are preferable if they are equally effective, particularly in patients with a normal pre-stenting pancreatogram. The authors also showed that severe post-ERCP pancreatitis could develop after prophylactic pancreatic stenting, but that this was exceptional (incidence 0.5 %). Figure 2 Pancreatic stents used for prophylaxis against post-ERCP pancreatitis. a Large pancreatic stent models similar to those used in controlled trials on the prophylaxis of post-ERCP pancreatitis. b The thinner models currently being used in some centers to improve rates of spontaneous dislodgment and to minimize stent-related ductal and parenchymal changes (see text for details). It should be noted that 3-Fr models only accept 0.018-in guide wires. Tarnasky et al. have presented the only randomized trial conducted to date of prophylactic pancreatic stent placement, which analyzed the relationship between accessory papilla patency and post-ERCP pancreatitis. In the group without stents, they found that post-ERCP pancreatitis was observed exclusively in patients in whom a patent accessory papilla was not demonstrated at pancreatography. These patients had an extremely high incidence of pancreatitis (43 % vs. 0 % in patients with a patent accessory papilla and no prophylactic stenting; P = 0.006). This suggests that a patent accessory channel left untouched may prevent post-ERCP pancreatitis. In experienced hands, failure to place a prophylactic pancreatic stent occurs in 5 - 10 % of cases. The risk of post-ERCP pancreatitis after manipulation of the pancreas with guide wires and contrast medium in such circumstances is extremely high (in the range of 40 - 66 %), even in comparison with sphincter of Oddi dysfunction . Prophylactic pancreatic stent placement should therefore only be considered when it can almost certainly be successfully completed (i. e., in the absence of anatomic variations such as small and tortuous ducts or ansa pancreatica). When a guide wire cannot be passed beyond the first turn in the pancreatic duct, the technique described by Freeman et al. may be useful . A short (2 or 3 cm) and thin (3 or 4 Fr) stent with one internal flap is placed using a 0.018-in Roadrunner guide wire (Wilson-Cook Medical Inc., Winston-Salem, North Carolina, USA), rather than repeating attempts to deeply insert a guide wire into the pancreatic duct. The Roadrunner has a flexible tip that is short enough to allow insertion of the stiff body of the guide wire through the sphincter, while the tip does not go deeply into the duct (it can be curled inside the main duct for better stability if this is sufficiently large). Although this guide wire is stiffer than other thin models, maintaining it in the distal portion of the duct during the exchange procedure is still particularly demanding. In conclusion, prophylactic pancreatic stenting should be strongly considered in young patients with suspected sphincter of Oddi dysfunction, needle-knife sphincterotomy, and biliary sphincter dilation (e. g., in patients with coagulation disorders). A highly skilled endoscopist with experience in pancreatic stenting must be available when this strategy is used (failed prophylactic pancreatic stenting is probably the condition with the highest risk of post-ERCP complications). 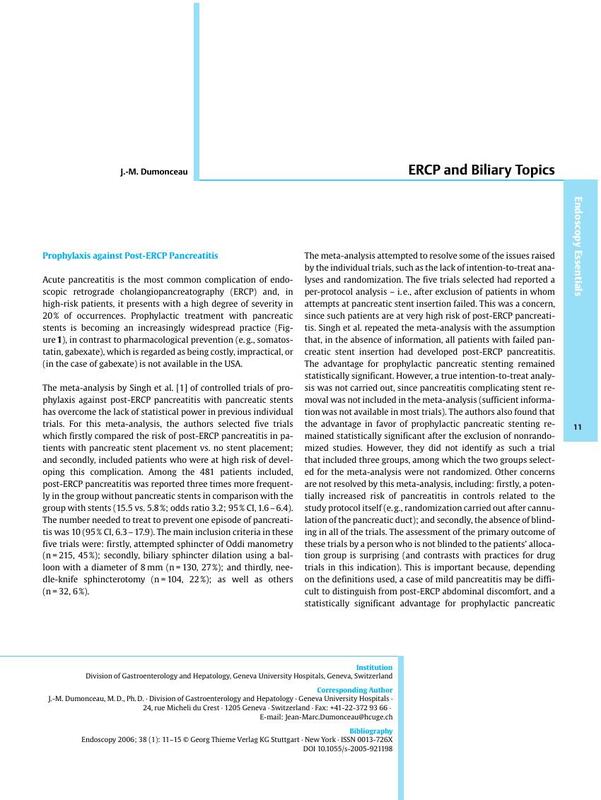 However, to be definitively adopted, prophylactic pancreatic stent placement would have to pass tests similar to those used for pharmacological prophylaxis of post-ERCP pancreatitis - i. e., blinded evaluation of the primary outcome in randomized trials on the basis of a genuine intention-to-treat analysis.